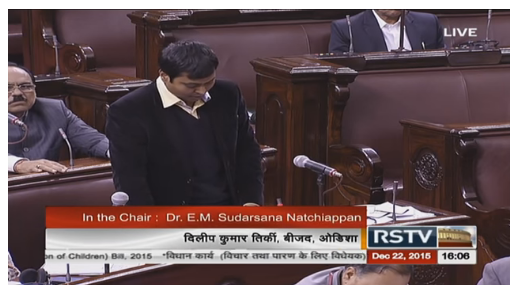 New Delhi, Dec 24: Former Indian hockey captain and Rajya Sabha member Dilip Tirkey on Wednesday raised the issue of sports quota recruitment in government departments and Centre PSU’s during the proceedings of the upper house of parliament. Giving examples of some rural and tribal players who have represented the country at the international level but are now in a woeful state due to unemployment, he mentioned how international athletes are forced to sell tea and snacks and run pan-shops. “It is highly saddening what do we want to give to our coming generations by showing this apathy towards our international players. This is happening because our government departments and PSUs are not filling jobs under sports quota,” the Biju Janata Dal (BJD) member said. “I would like to further request that government should interfere in this matter and all our distinguished sportspersons should be recruited through sports quota,” he reiterated. He also mentioned that all the government departments and central PSUs have a provision of five percent recruitment under the sports quota.